This 60 minute scenic flight over the Great Barrier Reef and Whitsunday Islands will give you an extensive view of the glorious Whitsunday region. You will have many prime photo opportunities as you fly over famous destinations such as Hook Reef, Hayman Island and Whitehaven Beach. 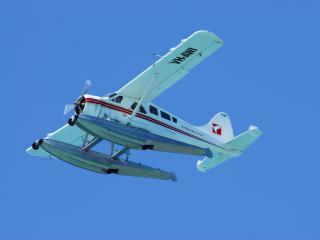 Enjoy the Great Barrier Reef Marine Park from the air on this one hour tour from Air Whitsunday. 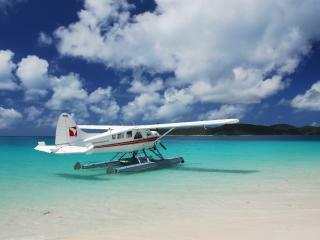 Fly over the scenic Whitehaven Beach and Whitsunday Islands, including Hayman Island. Also experience a touch and go water landing on the Great Barrier Reef, and have the opportunity to photograph Bait Reef, Hook Reef and Heart Reef! 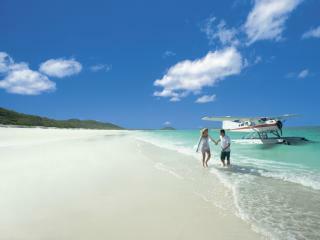 This is an excellent tour to experience the beauty of the Whitsundays if you are short on time! 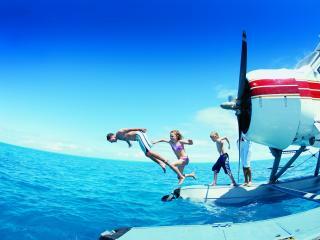 On the Panorama Tour you can explore the Great Barrier Reef and Whitsunday Islands from the air and under the water! This tour provides you with an hour spent on Whitehaven Beach and 2 hours at Hardy Reef enjoying the underwater marine life from the glass bottom boat or snorkelling. This is one of the most popular tours of the Great Barrier Reef and is a great inclusion to your family holiday or romantic getaway! Spend 3 hours enjoying the Great Barrier Reef and the Whitsunday Islands from the air on this Reef Adventure Tour from Air Whitsunday. You will experience a water landing at Hardy Lagoon where you will be able to enjoy coral viewing from the glass bottom boat and snorkelling in the sheltered lagoon. You will also have great photo opportunities from the air as you fly over Bait Reef, Hook Reef, Hardy Reef and Heart Reef! The ultimate way to view the Great Barrier Reef with a Reef Discovery Scenic Flight. 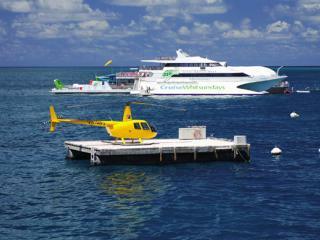 Indulge in the ultimate Great Barrier Reef experience with return helicopter flights to Reefworld. Features a 60 minute scenic flight encompassing views of the Whitsunday Islands, outer reefs and world famous "Heart Reef". 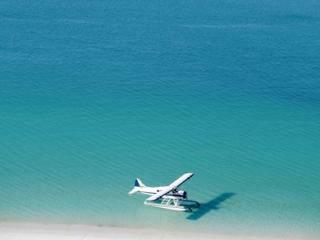 Discover the Whitsunday's most famous and beautiful beach, Whitehaven by Seaplane with Hamilton Island Air. This scenic seaplane flight takes you over the Whitsundays and then to Whitehaven Beach where you can swim, snorkel or explore the beach for 1 and half hours. Includes sparkling wine and water to enjoy on the beach. Whitehaven Experience is an ideal 2.5 hour tour that includes Whitehaven Beach and flying over the Whitsunday Islands and the magnificent swirling sands of Hills Inlet. Spend your time sunbathing on the beach, snorkelling, exploring or just relaxing under a beach umbrella. This scenic flight the perfect addition to your itinerary, and is an ideal way to see the Great Barrier Reef, Whitsunday Islands and one of the most beautiful beaches in the world if you are short on time!